Boys always strive for what their parents are doing. For this reason, many children want to become masters of fishing, seeing how their fathers go to the river every weekend to take a few fishing rods and a typical suitcase with all sorts of gear, baits, and hooks. But sometimes parents cannot take the child with them on a fishing trip. 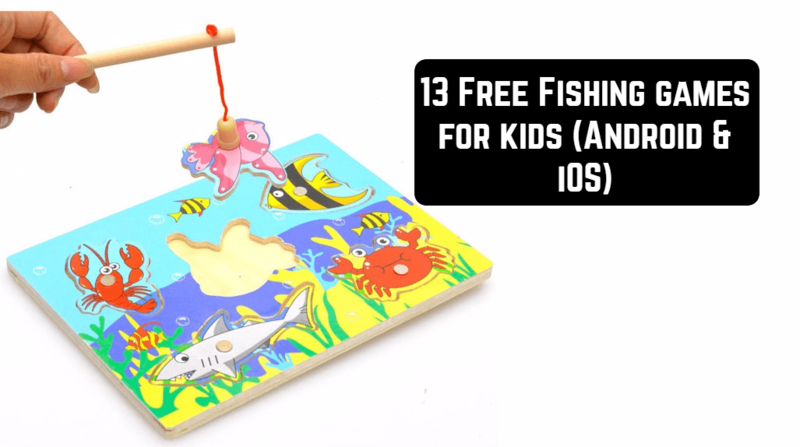 Then mobile gadgets come to help, and with them – entertaining games about fishing …Let’s look at the most interesting kids’ games about fishing. If you are looking for a good development game for your child, then you have already found it. Graphics and colors are designed taking into account the age characteristics of the child. Also, depending on the age, the game has several game modes. Thanks to this application, your baby can develop such qualities as mindfulness, perseverance, concentration. In addition to all this, the game is a good pastime for the whole family. The rules are the easiest – to catch the fish, which is depicted in the upper circle. Levels of difficulty depending on the age category. 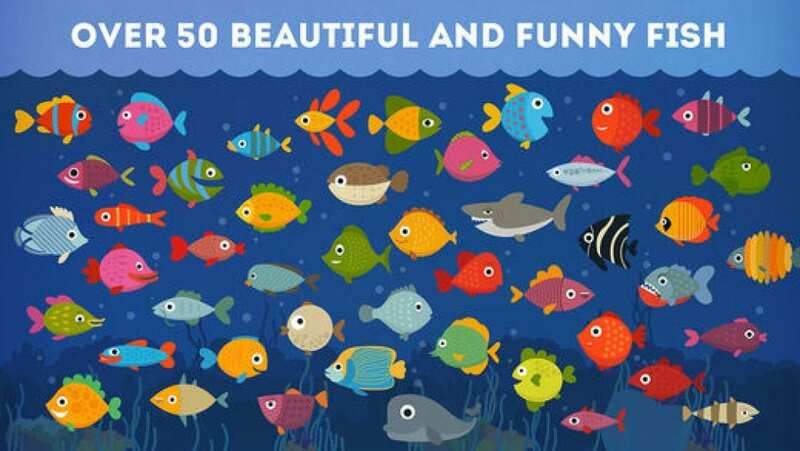 Colorful fish, which are more than 50 pieces. Quality sounds and good speed. Try your hand at a bright and entertaining game, learn the world with your child. 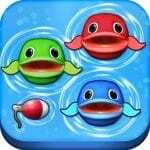 The purpose of the game “Fishing with Trunky” is to catch all the fish from the pool. Fish are caught only when its mouth is open, otherwise, it can be frightened away. 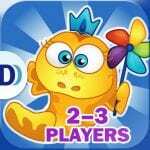 This game is positioned by developers for children from 2 to 8 years, however, it can easily entice and adults. Especially it is necessary to note the training mode, in which you need to fish with the desired letter or number – this will help the youngest children learn the letters and numbers. 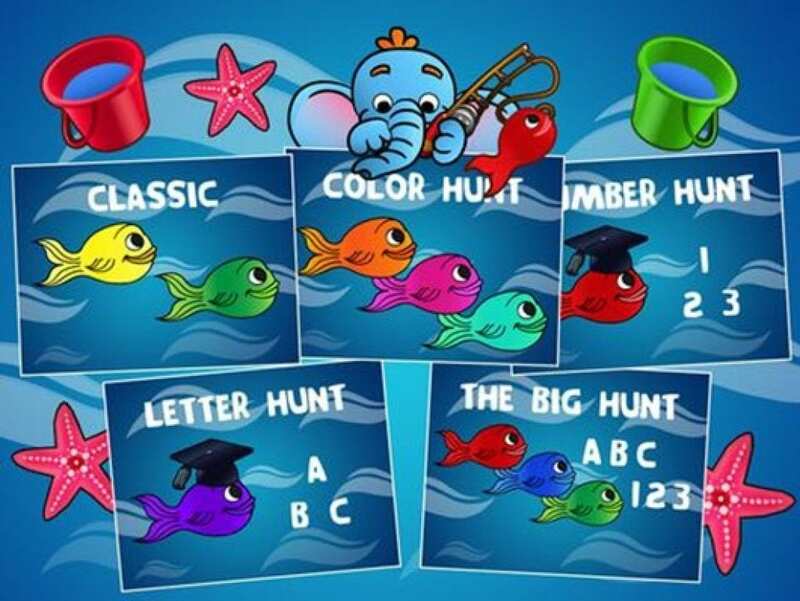 5 game modes (classic, catching fish with letters, catching fish with numbers, searching for the desired color and Jumbo. Mode 1 or 2 games. Very simple control, accessible even to the smallest children. Ability to complicate the game. Bonuses in the form of gold and silverfish. 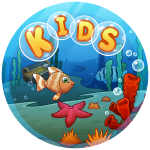 This is a development application for kids for Android, which allows the child in a playful form to learn the names of the inhabitants of the underwater world, as well as improve coordination of movements. 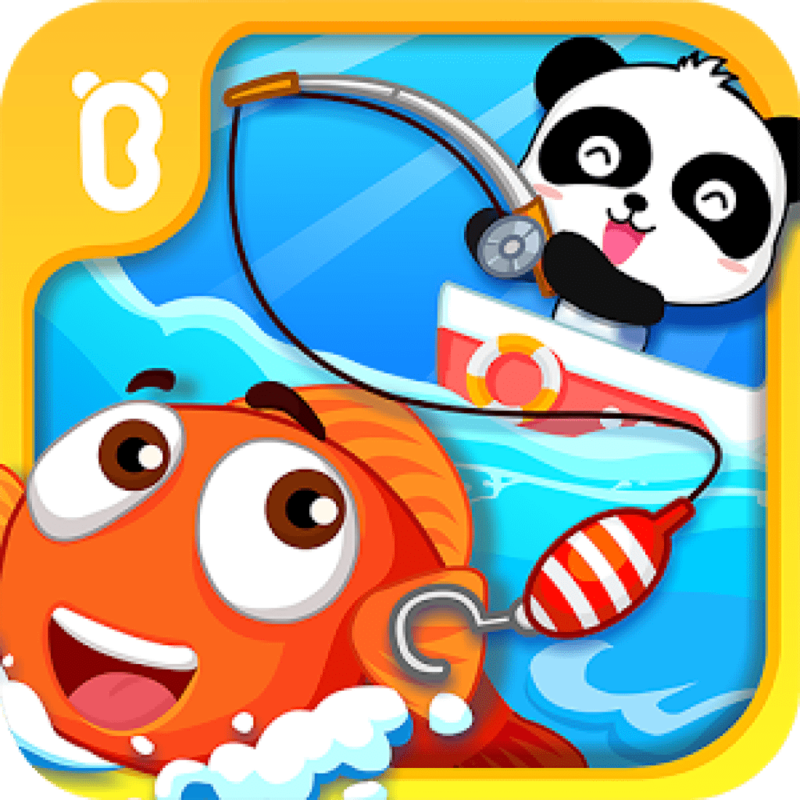 Together with the little panda Kiki, you go fishing to catch as many fish and other marine organisms as possible. You need to be careful and avoid whales and sharks, otherwise, your flimsy boat can turn over. The child actively learns the world from an early age, for the first time comes into contact with what is happening around him. Educational applications are an excellent tool for teaching children and occupy an important place in the education of the younger generation. 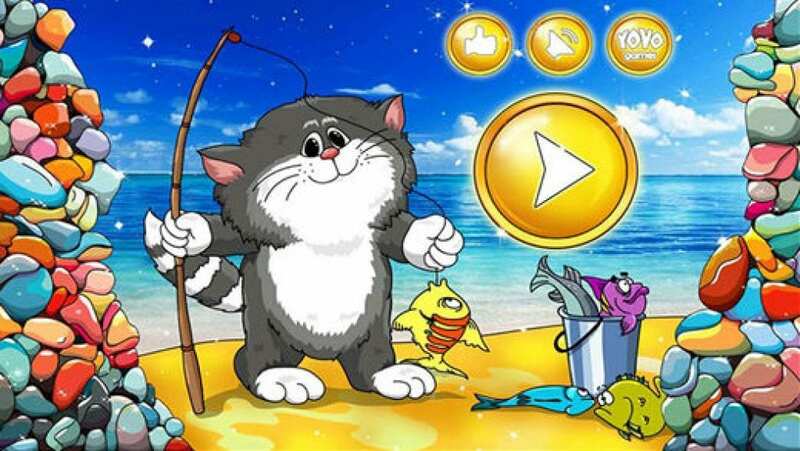 We offer a fascinating children’s game from YOVO Games “Fishing for kids”, which will become a favorite activity for children. 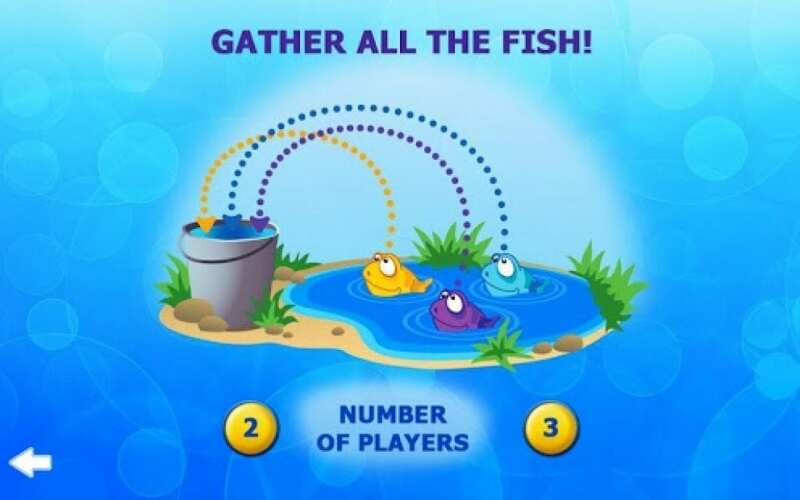 It’s very easy to play, you need to catch as many fish as possible and collect so many points that will allow you to move to the next level. But care is required so as not to get caught on a hook or a dangerous predator, this reduces the earned points. The game trains memory, improves concentration and fine motor skills. A keen fisher cat will cheer children throughout the fishing. 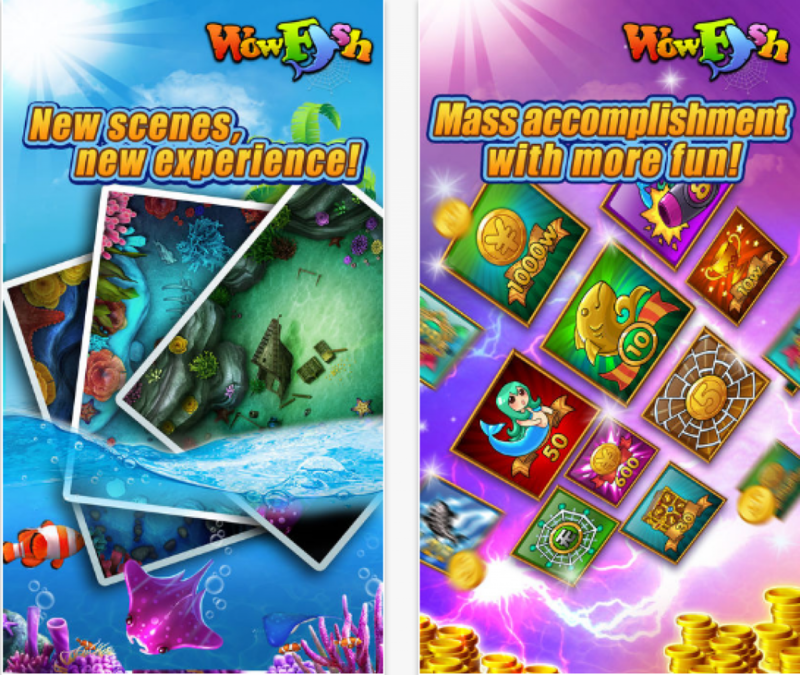 Colorful illustrations, bright pictures, pleasant music will give pleasure to all lovers of fishing. An uncomplicated learning game pleases the child with results and achievements, which help to acquire skills. It is very important to spend time with children with the benefit for their development. 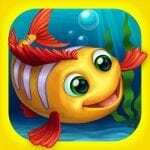 Happy Fish – an exciting game in which not only the child but the adult will breed fish and care for them. The project displays some of the features of acquiring, but more remains an arcade. 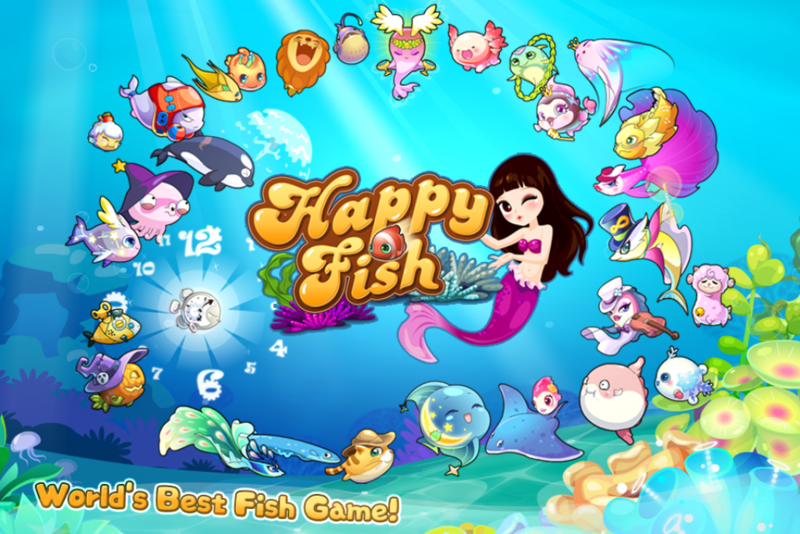 In the process of passing the user must buy fish, feed them, and also perform various tasks in order to get more money. The main goal of the game is to collect the rarest and most expensive creatures. 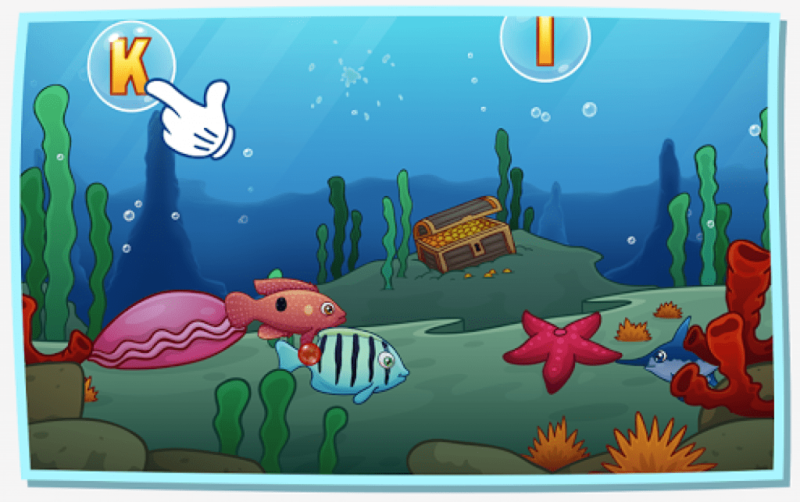 Also, in the arcade, there is a joint mode, allowing you to visit aquariums of other users, mini-games. In total, the campaign has about eight dozen levels, but their number is constantly increasing due to updates. The project is executed in a colorful drawing style. The picture is not realistic, but more cartoonish. Creatures are somewhat like Pokémon, and what’s happening on the screen looks very funny and cute. The menu is convenient and intuitive. Fortunately, there is not much text here. The music is fun and chosen well. Sound effects also came out funny. 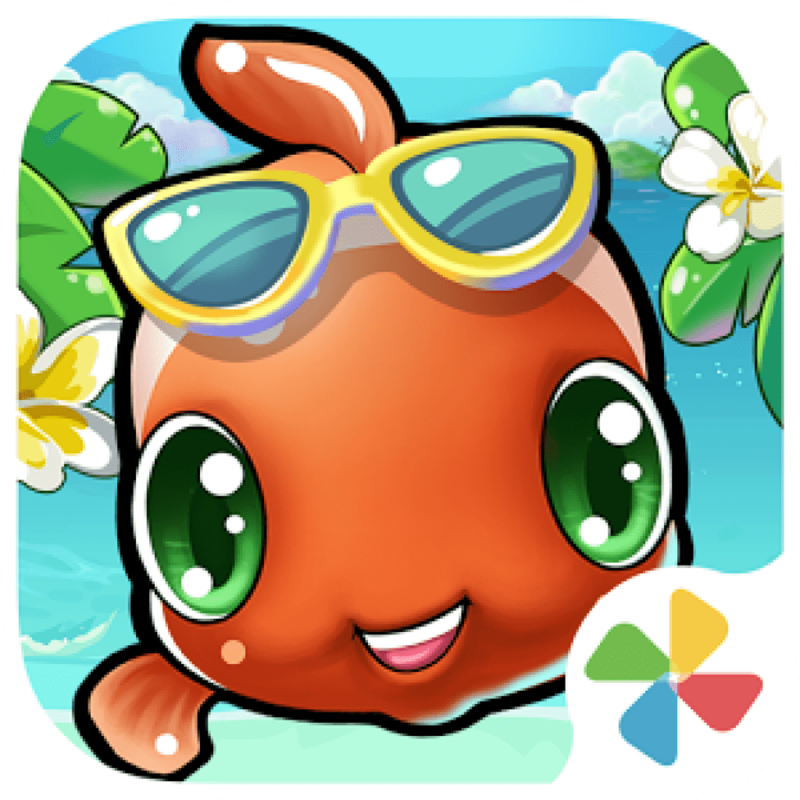 Happy Fish will not please with entertaining gameplay, but it will allow you to relax, watching how the fish reel in the virtual aquarium. The arcade is able to please the excellent design and lots of content. Tired of the same mobile games? Do you want to try something new and non-standard? If the answer is yes, then you now have this opportunity! Before us, a casual fishing simulator, seasoned with a magnificent design of the environment and colorful hand-drawn graphics. The minimum of realism is a maximum of fun. What could be better? So, gather the fishing rods and go on a grandiose trip to the most fish places on the planet. Despite the fact that Wow Fish was declared solely as a fishing simulator, the game didn’t do without other elements completely uncharacteristic of this genre. For example – puzzles. To catch the right fish, you need to shoot it in the net. Sounds easy, does not it? It’s only in words. Each fishnet has its own size, and it means that it will not work. In addition, do not forget about the financial side of the issue. You can get the net in your hands only by paying for it in the store, which means that only one unsuccessful shot (or wrong choice of size) is enough for your blood to fly into the pipe. Technically, the game boasts colorful three-dimensional graphics and an abundance of colorful visual effects. Whatever one may say, but despite its obvious simplicity, the picture looks surprisingly nice and can even be said – stylish. For such projects, this is more than enough. 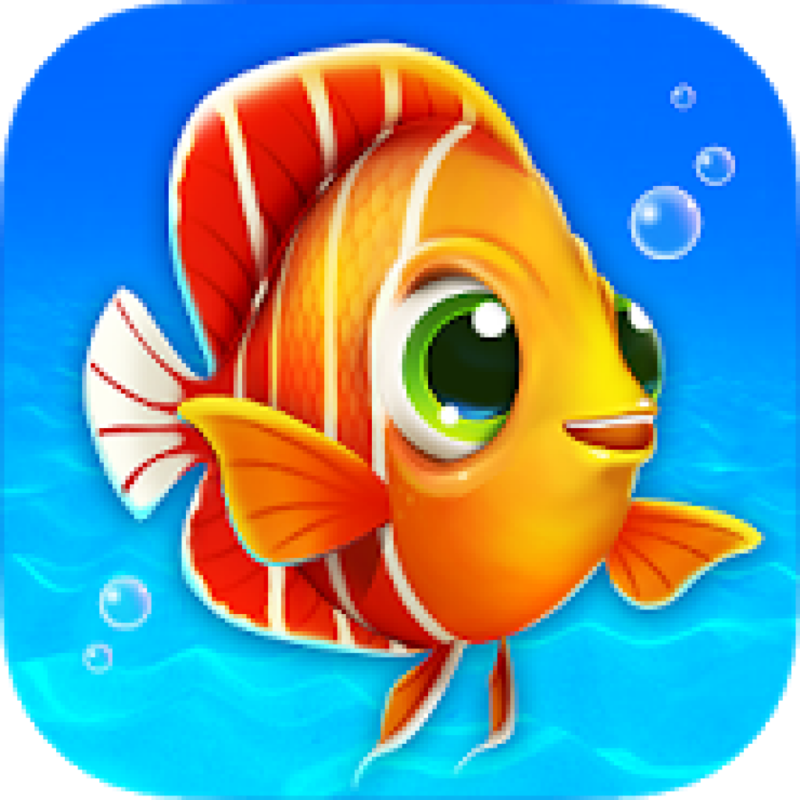 Wow Fish is quite an interesting and very non-standard fishing simulator, diluted with elements of the puzzle and arcade. A huge number of fish, gear, bonuses – just a short list of what is waiting for you inside. To all admirers of good casual simulators – it’s worth a try! 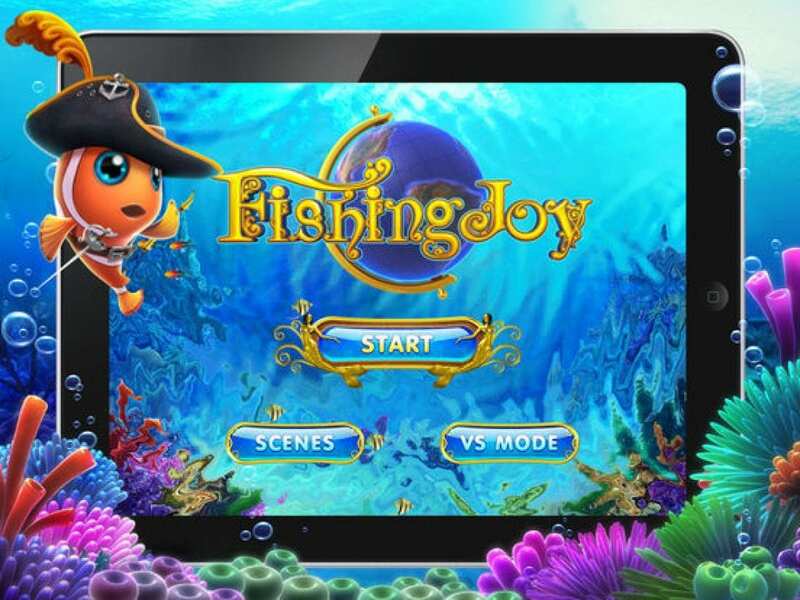 Fishing Diary – a fascinating arcade game for Android, developed by the studio DroidHen. An entertaining casual application in which we will be engaged in fishing. But not with a simple fishing rod as in simulators of this type, but with the help of a natural cannon firing fishing nets. Our main task and the main goal is to catch as much fish as possible. Using ordinary spinning, this will take a lot of time because, at our disposal, there are several types of guns that release shells opening into the fishing tackle. Each of them differs in the power and speed of the shot, and also the purpose of the net. After all, each fish needs its own fishnet with the required cell size. There are a lot of species of fish. Starting from simple fry and ending with jellyfish, rays and even sharks. 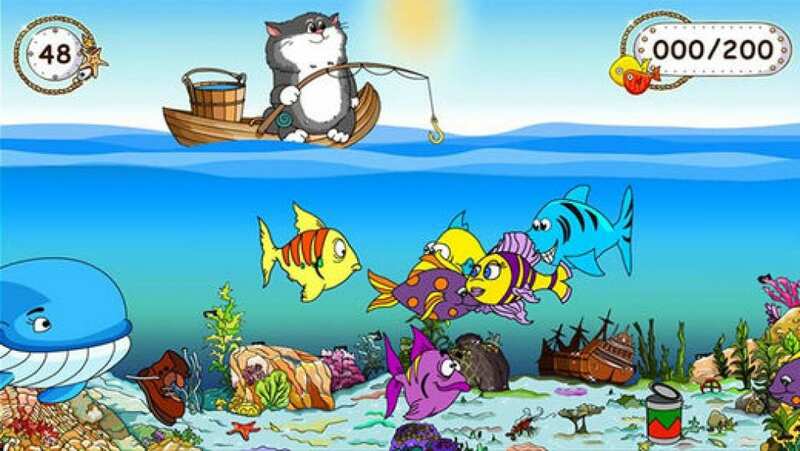 If you can manage small and medium fish with the help of nets, then you can not take large inhabitants of the sea depths. For our help, we have three additional tools for fishing. The first two are a bomb and an electric shock. The explosion of a bomb stuns all the prey in its radius of action, and the discharge paralyzes it. But the third tool is bread. Yes, simple bread. You throw it into the water, while a large accumulation of fish gathers around it and sprinkles the net. 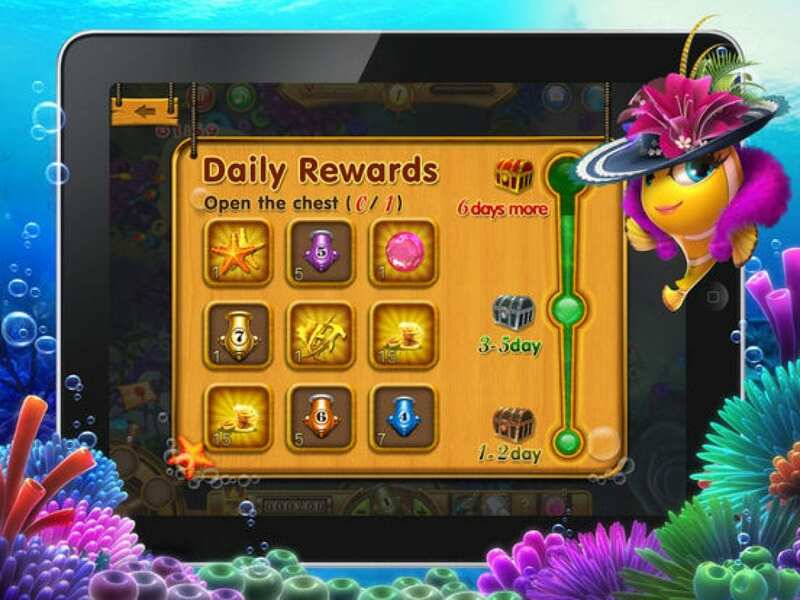 In the game “Fishing Diary” there are even mermaids, they seldom swim and if they lasso, they will bring a lot of gold. It is recommended to spend bombs and charges on them because both one and the second is very rare. And you can make up for ammunition for a very long time playing or for real money. 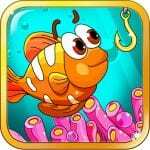 For each fish caught you are awarded gold coins. But it is necessary to learn that every shot from a cannon is accompanied by their waste. Because your income must cover expenses. Having accumulated a sufficient number of gold coins, invest it in the modernization of guns. From time to time a laser cannon appears in the game, from which you can shoot only once, so do not squander it, this time was very successful and profitable. As for the graphic design, it is performed at the highest level. The picture is not worse than in the cartoon about Ariel. Beautiful graphics, a nice soundtrack, and addictive gameplay provide more than one hour of comfortable play. One-touch control. There are no age restrictions, the game will appeal to both children and adults. An arcade in the genre of casual for fishing enthusiasts, especially with a constant time trouble for such entertainment. After the release of the first part of the game and the conquest of its popularity, PunchBox presented an improved version, correcting some errors of the original and adding more colorful features. 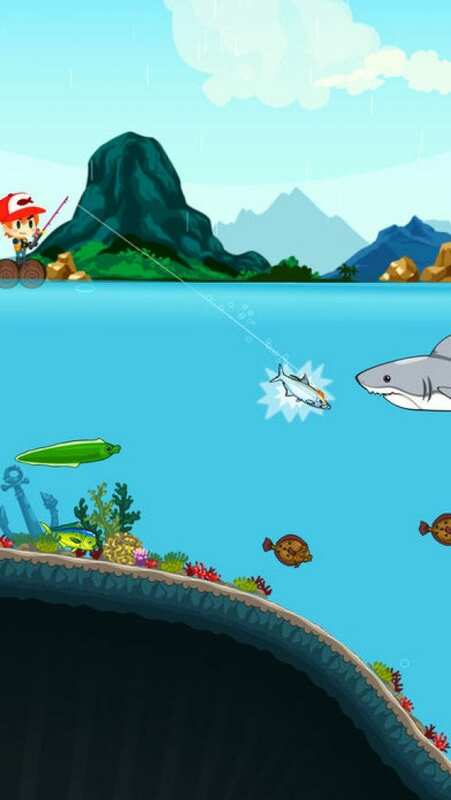 Fishing in this application is motivated by the plot – the user starts to fish with an ordinary harpoon, but as far as his catch – the sooner it increases – simple weapons can be changed to a much more sophisticated one, then – more and more. 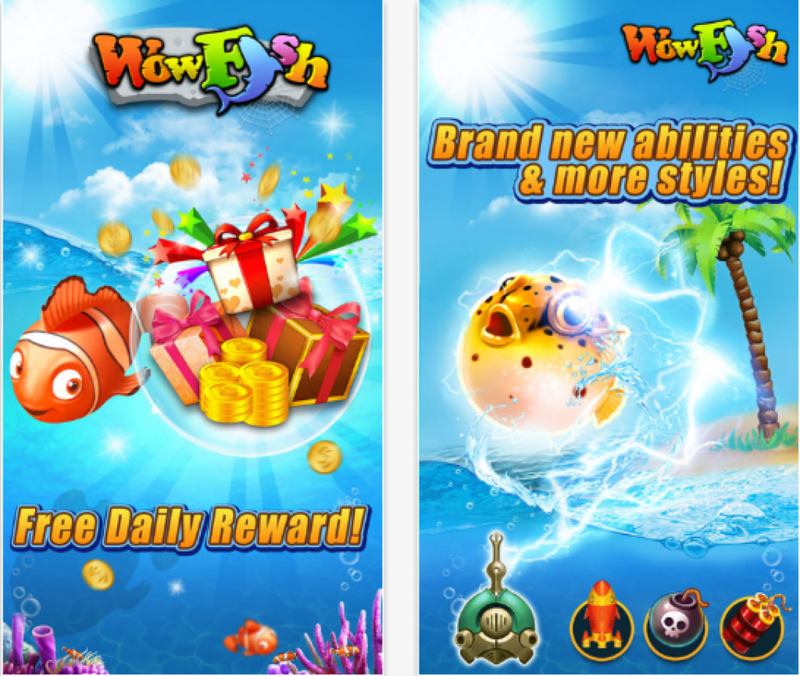 In other words, the status of the player grows from a beginner with a small reserve of coins to a real pro fisherman. 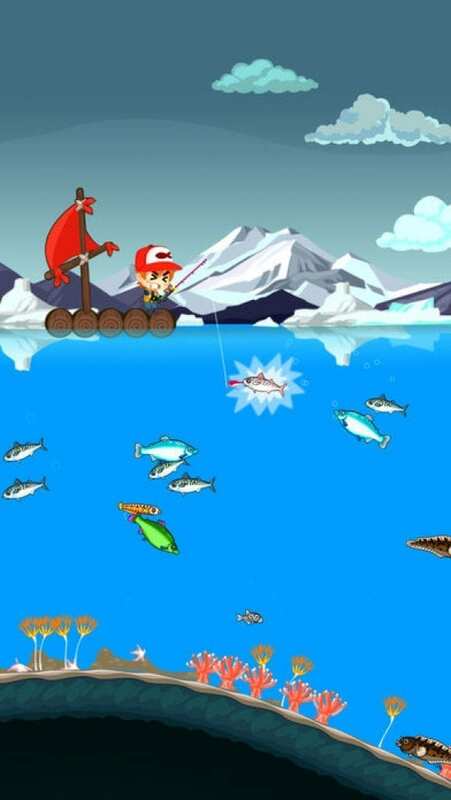 To catch a fish, the user should aim at his victim and click on the screen – the control is quite simple. 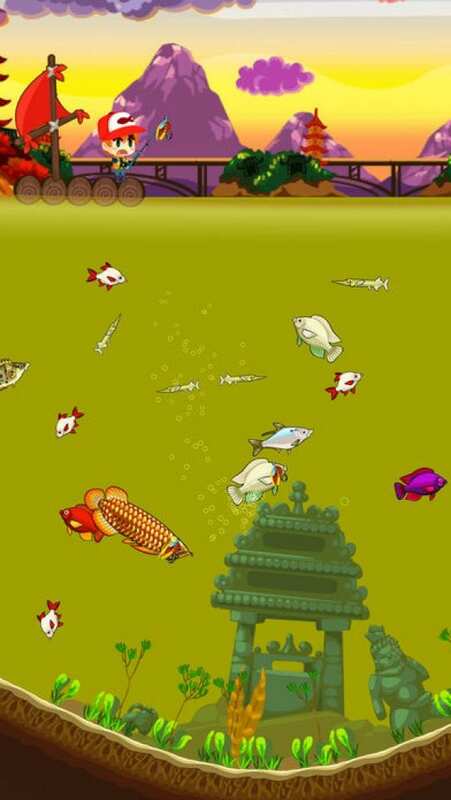 The colorful game has a huge selection of weapons and fish (eleven kinds of these), the better the player is equipped – the greater his chances of winning. 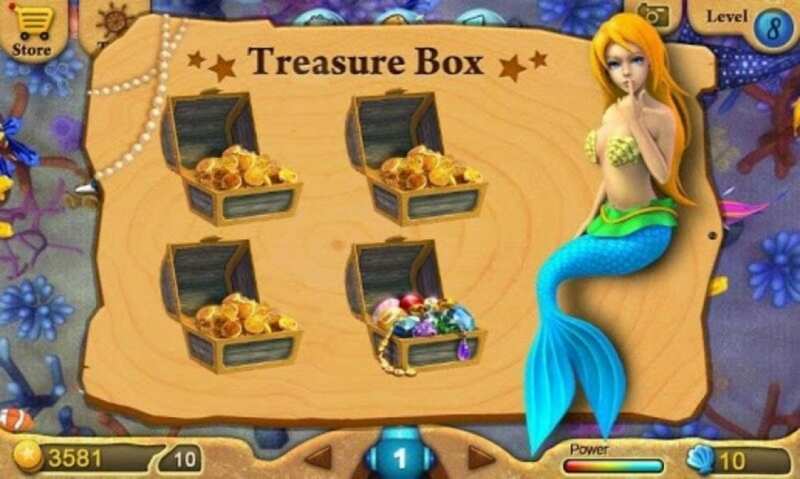 To increase opportunities in the underwater world, you can also shell out coins, secret options, of course, not cheap, but will help in the future to break through to a new level. So, for example, the grid – a weapon, irreplaceable for those who want to immediately catch a whole shoal of living creatures, in the toy upgrade up to seven levels, each of which is able to surprise and motivate to play further. Coins, by the way, are also earned during the game. Therefore, to obtain the most powerful firepower is much easier than one might think, besides – it is very exciting. 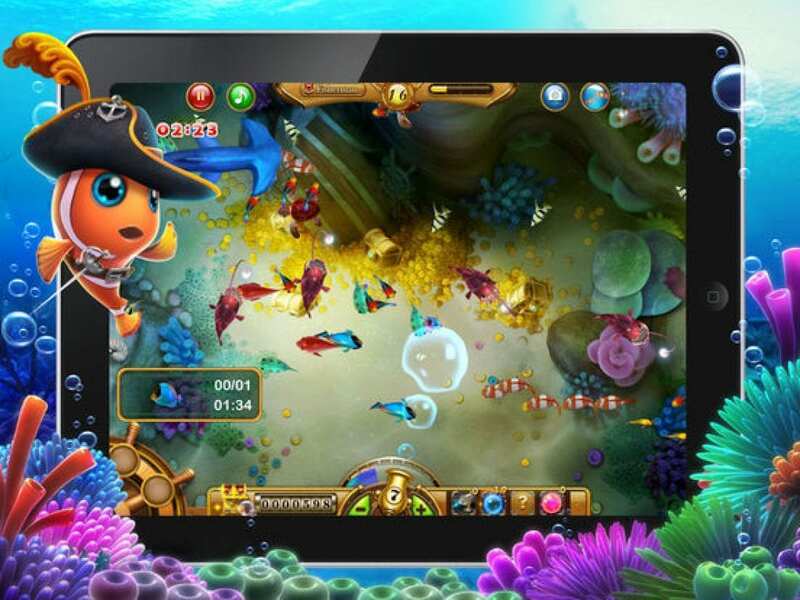 The developers have provided everything for the comfort of a potential player – the user has the opportunity to play in a relaxing Aquarium mode, but even on extreme fishing it is always accompanied by pleasant music, creating a special atmosphere that allows you to enjoy the game to the fullest. It should be noted and the excellent schedule of the application – it is executed at the highest level. This casual arcade is a Chinese application, so management in it is developed in the original language. However, English translators have prepared a high-quality adapted version. The guys from the “Roofdog Games” company have released a new arcade in which you will be able to fish. 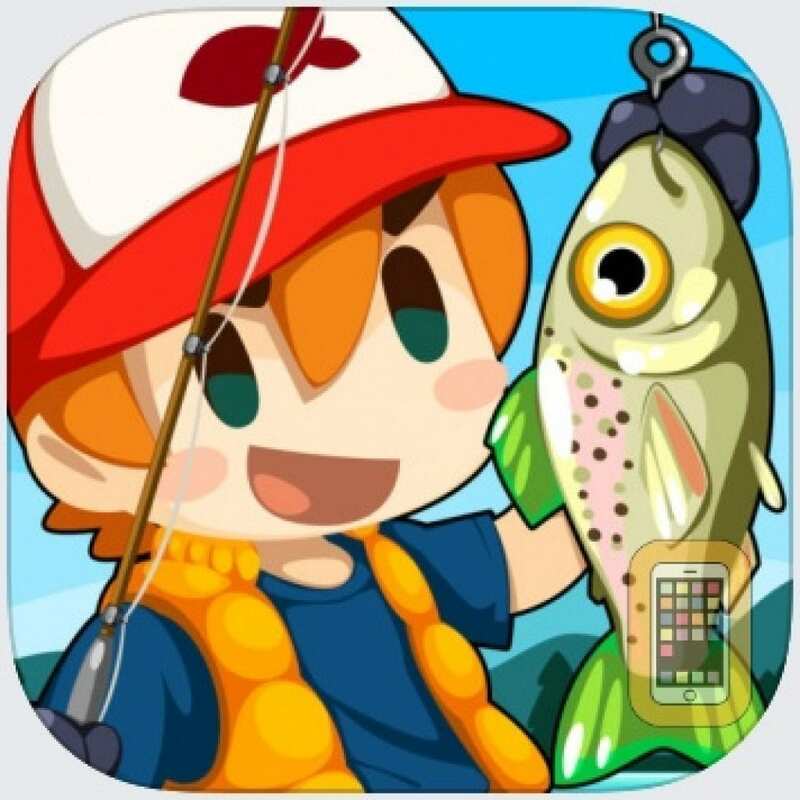 Anyone can download Fishing Break on Android and iOS. There comes a time when the player can go fishing. Take a boat with you, spinning and go fishing. The interest consists in the fact that there are several completely different locations. Each of the locations provides an opportunity to catch different kinds of fish. Catch a rare type of fish, upgrade your own equipment, and try to build an incredibly cool collection. 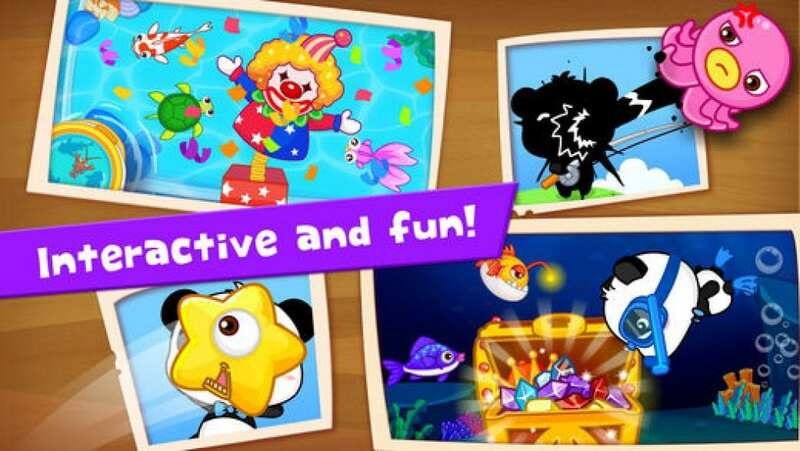 The game has some features, due to which it cardinally differs from other projects and attracts the attention of millions of users of the Play Market and AppStore. 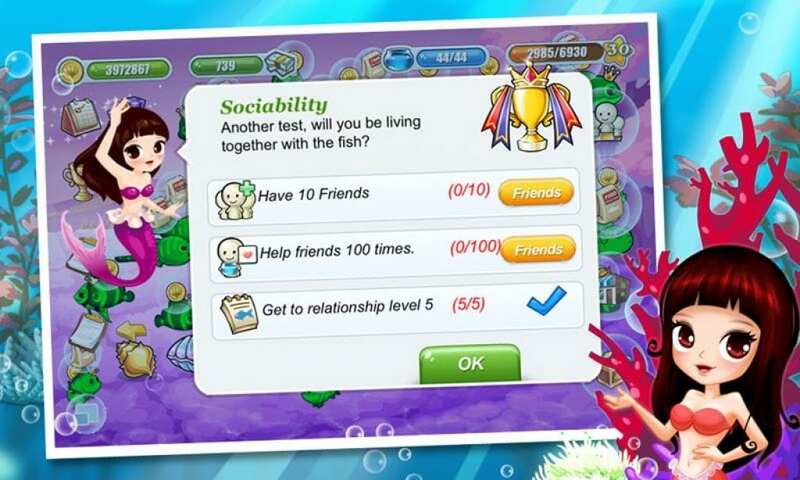 Try to catch as many fish as possible, increase your place in the rating table and compete not only with friends but also with all the inhabitants of our vast world. You can reach incredible heights, for which you will receive some rewards. There are 22 different places for fishing. All of them are located in different worlds, of which there are about 8 pieces. Among the fish, you can find hundreds of species. I would like to draw your attention to the fact that among them, there are sharks. In the game, you can spend a lot of free time. Rest during fishing, catch a fine fish, and prove to everyone that you are a real fisherman. The game turned out to be worthwhile, the developers have done an excellent job of it, added some famous kinds of fish, and will also be able to acquaint us with other species that until recently were completely unknown to us. Yes, there are such kinds. They are very beautiful and even tasty. Who would have thought, wouldn’t it? 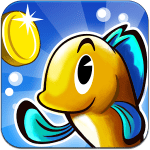 If you are ready to immerse yourself in this incredible world, then we advise you to download the Fishing Break on your device right now. This is a training application for boys and girls of all ages. 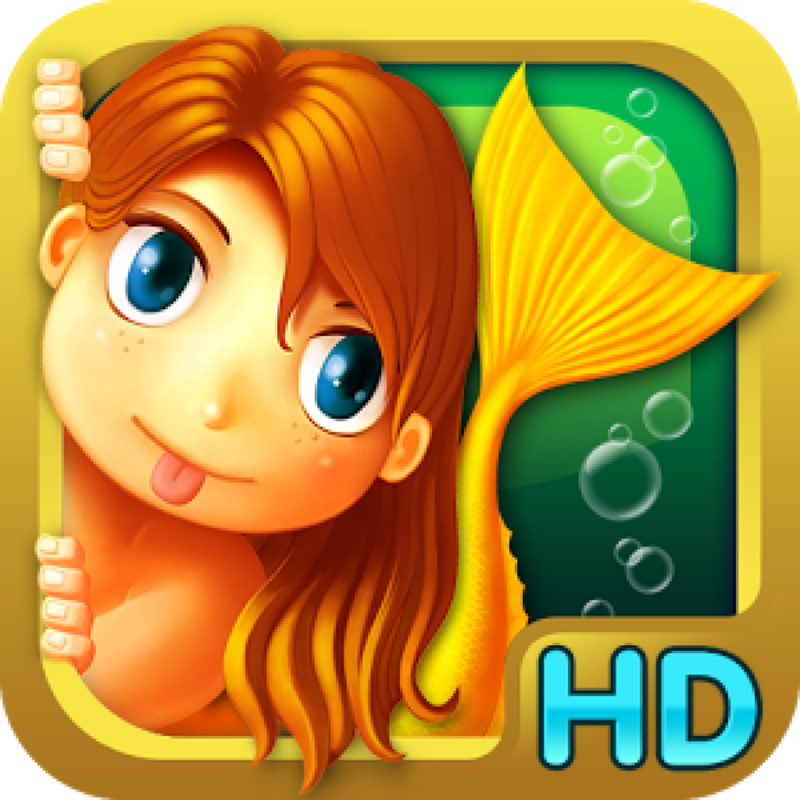 This game has an educational and disciplinary function, through which children in an easy entertainment form gets acquainted with the richness of the underwater world. Also, this game develops the children’s leadership qualities: in the process of the game, the qualities necessary in a competitive environment are formed, fixed and developed – to mistake, but do not give up and go purposefully towards the goal. The game has several secondary, but no less important tasks – to develop peripheral vision in children: this is when the vision is not directed at the tunnel to one point but covers a wide panorama of the horizon. Also, the game develops motor skills of hands, memory, coordination between the hemispheres of the brain, the ability to concentrate, imagination. Parents deserve special attention, for whom this game – the opportunity to gently conduct an educational lesson with their children on the principle – do as I do! This is also the case when parents can learn a lot from children. The game has a high-quality image – HD quality and unique music. 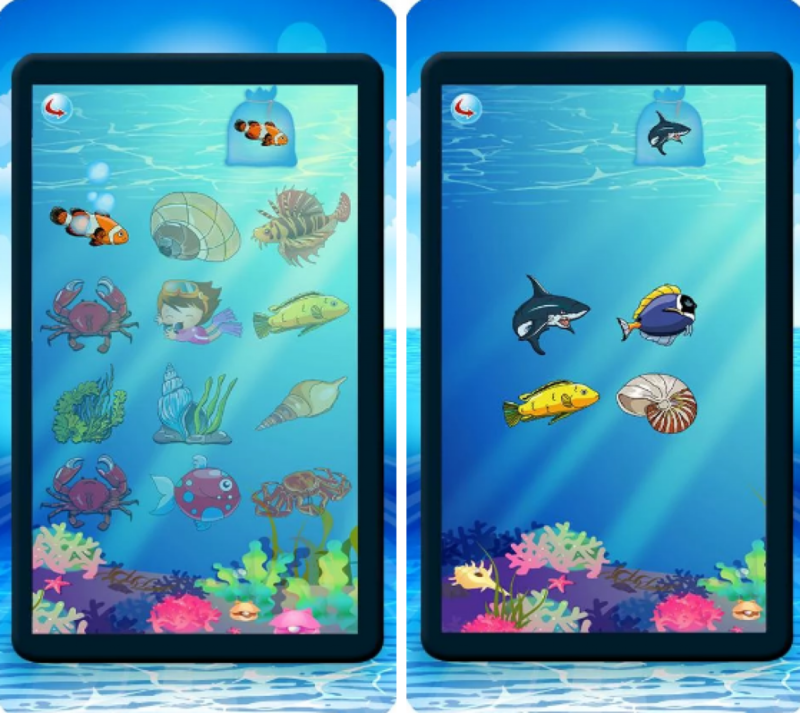 The game will help your child learn various marine animals and their habitat. The whole game is easy and fun. 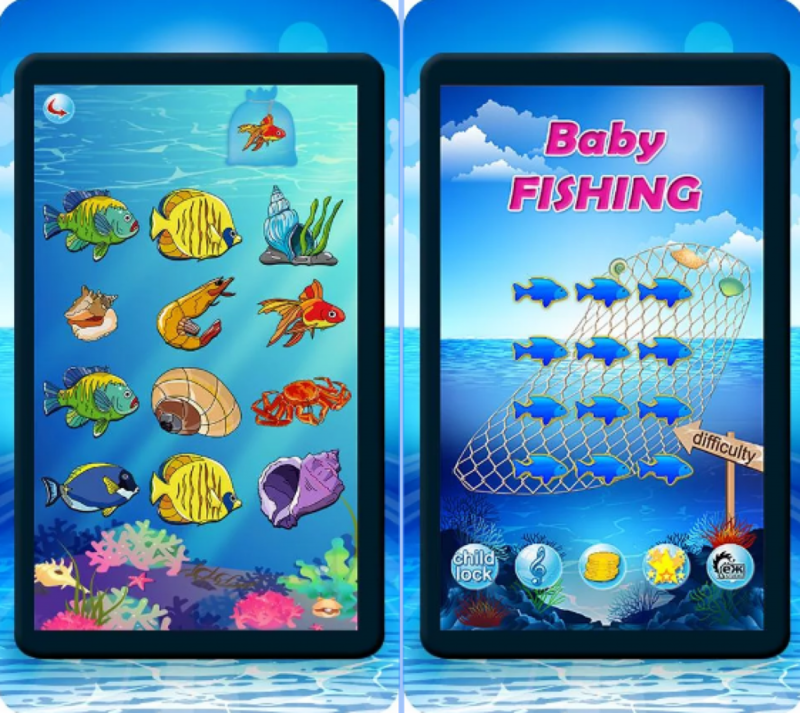 With the help of this application, your baby will improve the coordination of hands and eyes, will be able to expand his knowledge of marine organisms, and also learn the alphabet. 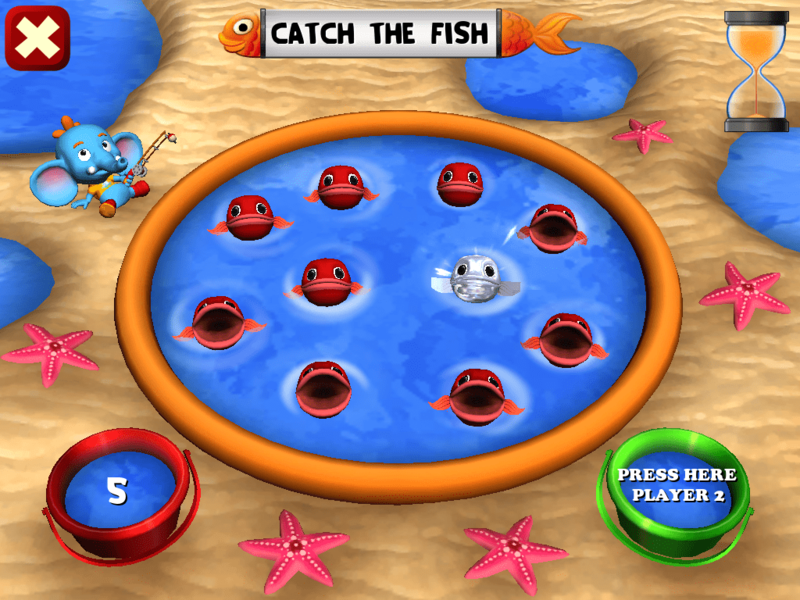 Colorful Fishing belongs to the category of those unique games, when several people can play at once for one device, which sharply increases its social status. The plot is quite simple. The “gaming table” is divided into three sections. On each of them, there is a lake, in which there are colorful fish. There are 9 of them in each lake. 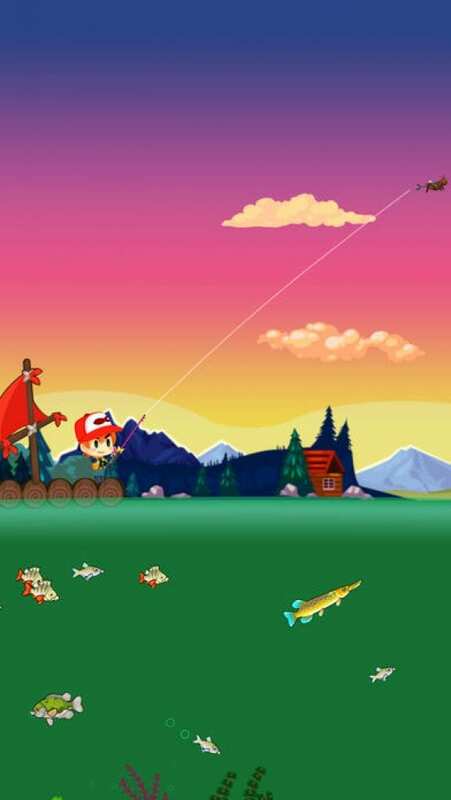 The goal of the game is to catch all fish from your lake before the rest of the players. That’s all. 🙂 However, this seemingly simple idea is realized in the form of a very original and interesting gameplay. The whole thing is how “fishing” is carried out – how you and your children will catch these very fishes. And here’s how it’s done: using the wheel of fortune! Making the next move, the player rotates a special drum, in which in different sectors, there are painted fish of all available colors (5 variants), and also there are “bonus” sectors. It is interesting, isn’t it? And it becomes even more interesting that the game is performed at the highest level in the technical and aesthetic sense! Looking at the presented screenshots, you have already realized that the graphics in the game is very pleasant. Fish, their surroundings, game drum – everything is drawn so that immediately evokes genuine sympathy. And if you heard what funny sounds the fish make when you touch them, you would immediately fall in love with this game. Background music also does not disappoint. Cheerful, simple, not distracting. In general – just right. In addition, both sounds and music can be turned off in one touch, without having to switch to the main menu. There is a system of hints: each your move will be accompanied by a text message, what should be done. children will master the important process of exchange. This is a unique human skill. And life-determining. The conclusions are obvious – this unique game simply must be installed on every gadget that children have access to. 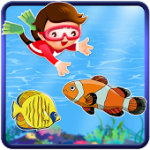 Dive to the bottom of the ocean to take care of the underwater inhabitants, combining various marine elements. 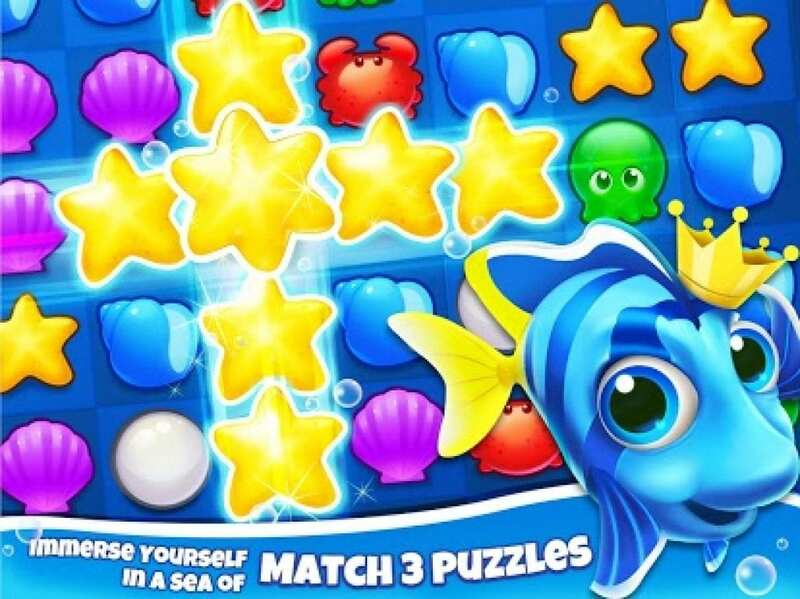 Objectives of the game: The game combines two genres: a traditional puzzle of three unlikely, in which you have to combine the same shells, pearls and starfish, and a casual game in which you need to feed colorful fish. Earn points you can use to open new skills, additional items, and much more. 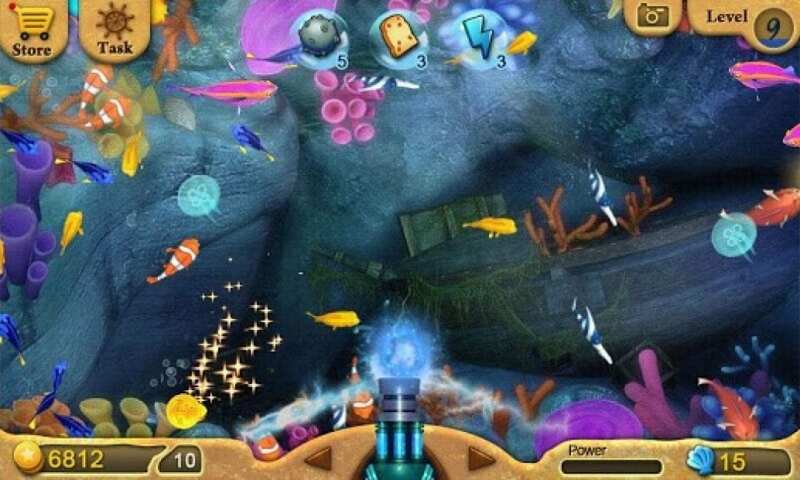 Graphics: The visual component of the game takes you to the bottom of the ocean, and the graphics will be pleased with its coloring and good study. Management: The intuitive touch interface will be especially liked by all children since all control in the game consists of simple finger movements on the touchscreen. 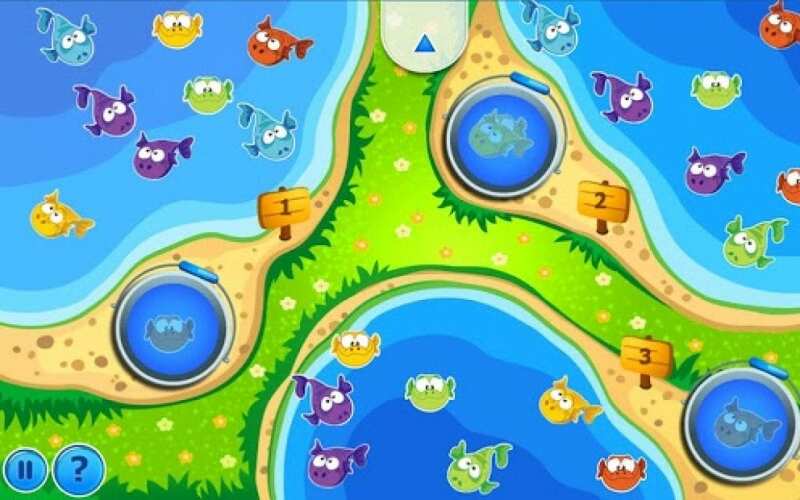 The Fish World is a fun game for the youngest users.